We are doing it again! After the great reception of streaming the Plone Conference last year to Second Life it will also happen again this time. From Oct 10-12 about 340 Plone fans and experts will meet in Naples for the Plone Conference 2007, over 50 people will give over 60 talks in 4 tracks. Topics will range from Beginner’s tutorials to highly technical details about the Open Source Content Management System Plone. And you can be part of this even if you are not in Naples yourself. 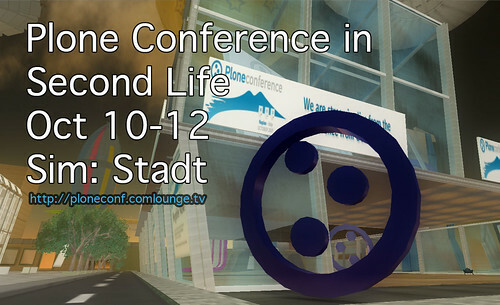 Just join us for the Plone Conference in Second Life. We are working hard right now to make streaming possible. The great thing is that Second Life also helped in finding a sponsor for streaming. Some months back I was visiting a Cisco event where the keynote of the Cisco CEO was streamed live to Second Life. The stream was provided by StreamGuys and we talked a bit about streaming into Second Life. This turned out to be a great connection as they are now sponsoring us to get the stream from Naples to Second Life. Thanks to StreamGuys! Also available will be streams via WWW of course. For more information check out the Plone Conference Streaming Page.